This is an preliminary design for my Arduino Uno Powered Self Balancing Robot. This Robot is built using Arduino Uno R3 as its main micro controller. The concept behind the Robot is simple. Its got only 2 wheels. The Robot needs to balance itself constantly and navigate itself around. This is much like how a Segway works. The Body of the Robot is made of Lego NXT blocks. It uses two "hs-311" servo motors, these are full rotation servo motors. These are mounted on Lego Frames using HSK311CR NXT mounting kit from mindsensors.com. The concept is very simple Arduino Uno will motor whether Robot is falling forward or backward and send commands to the Servo Motors to go forward and backward to compensate. In reality the Robot is constantly falling and compensating for the fall. Arduino relies on a 3 axis sensor to know whether its falling forward or backwards and calculates how much to move forward and backward. Apart from this the Robot has eyes using Ultra Sonic Sensor. These enable the Robot to see few inches ahead (in theory) and know if something is blocking its way and if so, it will change its path. Disclaimer - The Robot is under construction, the above theory would be tested and modified as it is built and running. Make AR Drone Follow Objects it sees keeping a constant distance. 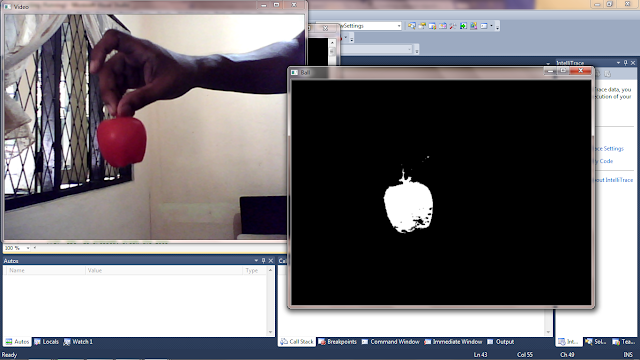 The idea is to use OpenCV and one of its many techniques to Track Object. Simplest of them being Track Objects by color. Before we talk about using OpenCV to measure Depth, we need to understand more about Computer Vision. Human Beings have 2 Eyes to give them a Perception of Depth. We focus on an Object and that Object is in center for both of our eyes. Rest of the objects which we do not focus on either move left or right. Our Brain uses this information to figure out the depth/distance. 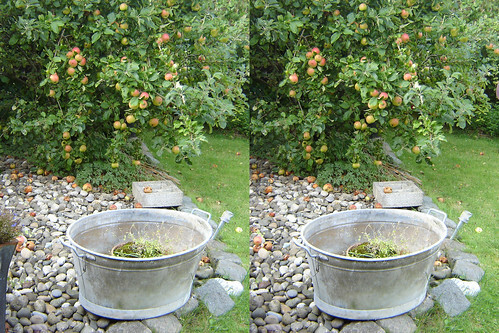 If same has to be applied to Computer Vision (CV), then in the above picture the Light Objects are closer and Darker Objects are farther. The biggest problem to apply the above theory to AR Drone to track object and especially its Depth is that AR Drone has only one Camera (One Eye). What we need is a light weight solution which gives our AR Drone Camera a Stereoscopic Vision.